Sviatoslav Richter was a great advocate of the music of Karol Szymanowski. Not only did it appeal to his temperament, but Szymanowski had been a cousin and close friend of his teacher Heinrich Neuhaus, who played the premiere of Szymanowski’s Masques. 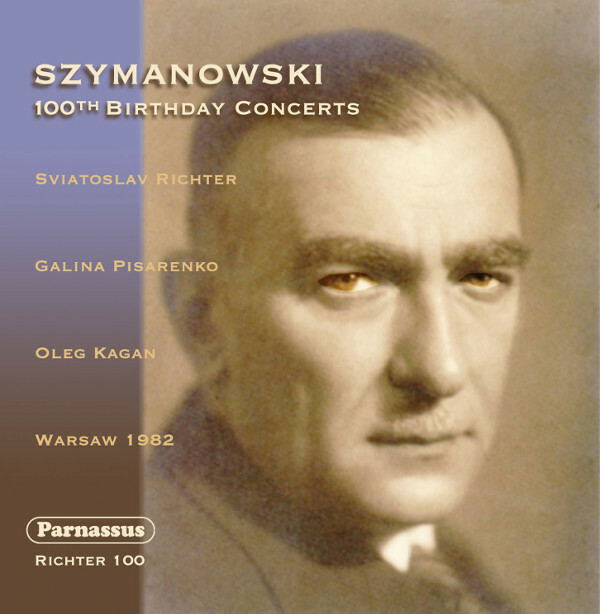 In 1982, to commemorate the 100th anniversary of Szymanowski’s birth, Richter put together two complete concerts of Szymanowski’s music. He was joined by soprano Galina Pisarenko in two of Szymanowski’s song cycles and by violinist Oleg Kagan in Szymanowski’s Mythes. Pisarenko and Kagan were both valued colleagues who performed with Richter many times. Although the pair of concerts was given in several locations, it was apparently recorded professionally only once, in Warsaw, by Polish Radio. Through an arrangement with Polish Radio, Parnassus has now published a two-disc set including both concerts, recorded on November 25/6, 1982. The recordings are of fine professional quality and convey the virtuosity and color of Richter’s playing at their best. Our arrangement with Polish Radio allows for the production of only 1500 copies. The set will not be reprinted once the initial pressing is sold. Parnassus CDs are distributed in the U.S. by E One,, in Italy by La Tosca, and elsewhere by alto distribution and associated distributors. Karol Szymanowski was born in the town of Tymoszowska, Ukraine, on October 6, 1882. He began to take piano lessons from his father at the age of 7. At ten, he was sent to the piano school of Gustav Neuhaus in Elisavetgrad, as were his three siblings. Neuhaus was the husband of Olga Blumenfeld, a cousin of Szymanowski’s father. He was also the father of Heinrich Neuhaus, who was thus a cousin of Szymanowski. Heinrich eventually became Sviatoslav Richter’s teacher. Heinrich and Karol were not only relatives but also close personal friends. They were separated only by the Russian Revolution of 1917. Szymanowski dedicated the second piece of his “Masques” to Neuhaus, who gave the first public performance of the entire set. Aside from Richter’s obvious affinity for the music of Szymanowski, he was strongly motivated by the personal connection through his teacher to promote Szymanowski’s works. He played them throughout much of his career. Late in Richter’s career, he became fond of celebrating the anniversaries of composers. Among other events, this led to his playing a selection of Grieg’s “Lyric Pieces” as an entire recital in 1993, the 150th anniversary of the composer’s birth. And in 1982, to celebrate the 100th anniversary of Szymanowski’s birth, he prepared two all-Szymanowski concerts. These included some music (“Masques,” Sonata No. 2) which he had frequently performed in the past. (He played the Second Sonata in concert some 45 times, from 1945 to 1984.) But for the anniversary he revived works he had not played in many years, and added the Sonata No. 3 to his repertory, playing it 13 times in that year only. The Szymanowski anniversary concerts were performed several times in October and November of 1982, always with the same program. A recording of the Paris concerts, recorded in poor quality from the audience, has circulated privately for some years. Apparently the only professionally-recorded version of these programs was made by Polish Radio at the Warsaw concerts of November 25 (at the Warsaw Philharmonie) and November 26 (at the Warsaw Academy of Music). While our transcriptions are regrettably lacking two songs sung as encores, they otherwise present the complete contents of these concerts, now issued for the first time. After the death of David Oistrakh, Oleg Kagan (1946-1990) became Richter’s favorite partner for recitals of violin and piano music. They gave many performances together as a duo and occasionally as a trio with Kagan’s wife, the great cellist Natalia Gutman. This collaboration was cut short by Kagan’s early death from cancer at the age of 44. The recorded legacy of this collaboration includes works of Beethoven, Mozart, Shostakovich, Hindemith and others. They played nearly 100 concerts together. Galina Pisarenko (1934- ) participated in numerous concerts with Richter from 1980 to 1993. They had known each other for years before that, as Pisarenko was a student of Richter’s companion Nina Dorliac. In 1971, Richter wrote in his diary, “to miss out on a concert by Galja [his nickname for her] is impossible for me and my friends.” While rehearsing Szymanowski with her in 1980, he wrote, “A grueling, complex and also quite independent cycle. Difficult in the intonation and also because of the ornamentation, which calls for an extraordinarily fine coloring. The piano accompaniment is as demanding as the solo works.” But, unusually, he was eventually satisfied both with the singer’s contribution and with his own. Parnassus CDs are distributed in the U.S. by E One, in Italy by La Tosca, and elsewhere by alto distribution and associated distributors.